So you decide that you want to lead a healthier lifestyle and start exercising. Great! But should you sign up for a commercial gym? Or try working out at home? I decided to lay out some pros and cons to each. For the purpose of this particular post, I’m going to focus on signing up for a commercial gym as opposed to small boutiques or personal training studies. Also, when I talk about working out at home, I mean doing exercise videos or using dumbbells/other small equipment (as opposed to building your own home gym). Since I work out at my local YMCA, it was easy for me to think of a lot of the benefits of this. However, there could be some “cons” that may deter you from joining a gym. A lot of different equipment, so it’s easy to switch up workouts. Personal trainers and wellness coaches to help you and give you tips. Seeing other people working out may motivate you. You’re changing your setting so you get out of the house. The thought of having to drive to the gym could mean skipping a workout more often. A lot of different equipment could be confusing and overwhelming. 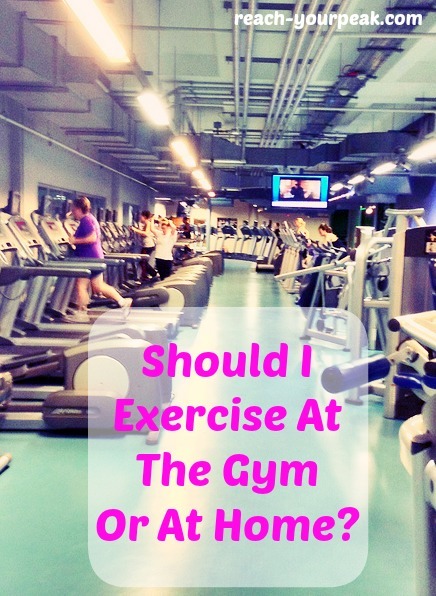 Gym can get packed which could be annoying if you need specific machines or equipment. Gym membership could be expensive. It may be intimidating to workout around others. Take a gym tour of equipment before starting. Don’t be afraid to ask a trainer to show you correct form or spot you. On days you don’t feel like working out, take a class instead. The group atmosphere helps a lot. If possible, go at off peak times so you can use the equipment you need. Going during times that are less busy will also help if you’re intimidated of the weight room. Working out at home has a lot of its own benefits. When I first started exercising in college, I did a lot of workout DVDs in my room. I loved Jillian Michaels! This is what inspired my recent post where I listed out my top workout videos on YouTube. Even when you have no energy you really have no excuse, since you don’t have to go anywhere to work out. You can multitask (workout while waiting for dinner to be ready). You can vary your workouts by doing different workout videos and DVDs. Less intimidating because you’re working out alone. Great way to get family members in your house involved in fitness. Unless you have a home gym, you may not have a lot of equipment to use. You may not be as motivated because you’re working out alone. Family could be a distraction/interrupt your workout. Set up a time that you WILL do your workout. Think of it as a meeting that you can’t skip. Let your family know about your time, so that way no one will distract you. Make a YouTube playlist of workout videos, so you always have a selection ready. Try a new DVD each month to switch things up. Get a friend or two to come over and workout with you! So as you can see, there are great things about both options! Some days I’d rather workout at home with my mom or dad than go to the gym. It’s just more convenient and after a long day of work, I just don’t feel like getting ready and driving another 15 minutes to the gym! There are some great fitness channels on YouTube like SarahFit and Blogilates…and myself ;)…just do some research and find workouts that best fit your needs. What pros & cons did I forget about? Which do you prefer? Working out at a gym or working out at home? Buying fitness related stuff can get addicting. I love shopping for new workout clothes, and when I see gadgets and other stuff for cheap at T.J. Maxx or Marshall’s, it’s hard to walk away! I’m going to highlight some typical fitness items, with a “save” option and a “splurge” option. Some things are worth splurging on, while other things you could definitely get away with buying at a Five Below – but it really all depends on you, and how often you use certain things. This all depends on how often you do yoga. I think if you do it once a week or so, like I do, then it’s okay to save on a yoga mat. 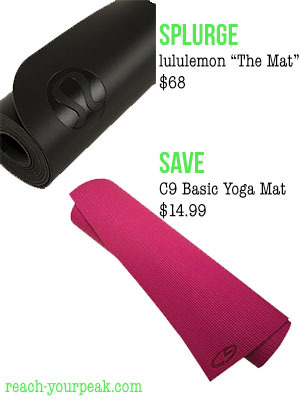 The C9 Basic Yoga Mat is from Target, which also has other brands like Gaiam. I have used the lululemon yoga mat at their community classes and love it. My hands don’t slip at all. However, I don’t do yoga enough to justify buying it…but maybe one day! Getting adjustable dumbbells has been on my to-d0 list for a while. 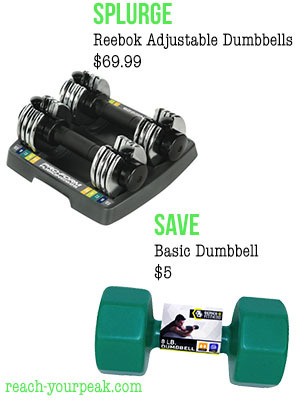 Once I have a home gym, I will definitely get a pair of these Reebok adjustable dumbbells (also available at Target). But, really, all you need for an at-home workout are a pair of dumbbells ranging from 5-10 lbs. The one above can be found at Five Below. If you don’t have one of those near you, check out Target or T.J. Maxx too! 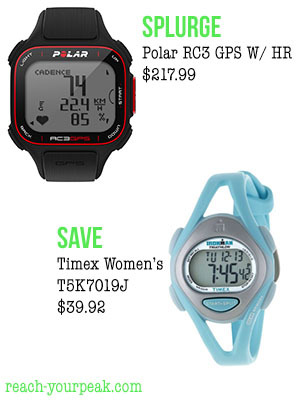 You can look up both of these watches on their brand page, but I found that you can save a good chunk of change on Amazon*. The Polar GPS watch comes with a heart-rate monitor if you like to see how many calories you burn. I personally have a Garmin, but know a lot of people who own Polars and love them. I like that it’s a GPS and HRM in one. But if you don’t need all that, this Timex Women’s watch will do the trick. I like that it’s light and small, so it could be used in everyday life too. There are a lot of other products I could include, but I’ll save that for Part 2! One thing I will say you should always splurge on is a good pair of sneakers. What fitness item do you have no qualms about spending a little extra on? For me it’s running shoes and shorts! Do you use apps to help you workout? Or track your workouts? I have been using a few different fitness apps over the past few years, but have found a couple that I love and wanted to share with you. Oh, and most of these are free! You can pay for an upgraded version but I have not done that on any – they work just as well in the free version! RunKeeper is my go-to running app. You can play music through the app, and I just set it and forget it. You can set up audio cues for when you want it to tell you how far you have gone (i.e. – every mile, every 2 miles). You can also have it tell you your distance based on the time you’ve been running (i.e. – every 10 minutes it tells you your distance). I have it set so that every 1 mile it tells me my average pace. The one thing I wish it did was tell me my current pace, like my Garmin watch does. It has a “current pace” feature but it is way off sometimes. You can also set up workouts, so that it will tell you to run hard for 20 seconds, then cue you when to jog, then start again (did that make sense). Lastly, it has various training plans you can use from 5K training to marathon training. I use this app for tracking my nutrition. It’s so simple and straightforward. They have a huge list of foods that you can search, but if you can’t find a specific thing, you just scan the barcode on the food item. You can set calorie goals for the day, depending on if you tell the app how much weight you want to lose by a certain amount of time. You can also just put that you want to “maintain” weight. I like using it so I can track my macronutrients and make sure I’m getting enough protein, carbs and fat. I wrote a more in-depth review here. You may have heard of GymBoss timers (like physical timers). Trainers use them in videos because they beep whenever your interval is up, as opposed to looking at your phone or watch every few seconds. Well, there’s an app for that! I’m sure there are plenty of interval timer apps but I really liked this one. You set up your intervals and it beeps every time an interval is over, and every time you need to start a new interval. You can repeat the sets for however long you want it to go for. You can save each workout you do so that you don’t have to re-set everything up each time you need it. The only downside is I think when you lock your phone it won’t beep, so make sure you turn the lock screen off. You put in whether you want beginner, intermediate or advanced, and what you want to train, and it will crunch out a workout for you. It gives you pictures for demonstrations and tells you how many reps/how long to do the exercise for. Great for when you’re at the gym and not really sure what to do! Here are a few other apps that I found, or that I have had friends rave about. This is another running app similar to RunKeeper. I haven’t used it but I think most people either use RunKeeper or MapMyRun. Looks like MapMyRun is compatible with the UnderArmour heart rate monitor which is pretty cool. Try each one out to see which one you like best! I actually used this when I had an iPhone. It’s not a fitness app per se, but it’s good to know how much you’re sleeping and whether it’s restful or not. Jury is out on whether it is reliable data or not, but it is pretty cool to try out. It did correspond to when I’d wake up in the middle of the night and stuff. It analyzes your sleep and then wakes you up when you’re in the lightest phase of sleep (as opposed to in a REM cycle). You set your alarm for a 30 minute period, so that it will wake you up within that time frame. I love Cassey from Blogilates, so I had to throw this in here. I didn’t get a chance to download her app when I had an iPhone, but I need to check if there is one for Android. (Update: It is available in the Google Play store). You can access her videos through the app, along with recipes, her community and her monthly workout calendar. If you’re not familiar with her, check out her YouTube channel! She’s always so vibrant and positive, it’s hard for it to not rub off on you while you’re doing her workouts. Also, they burn. I’m sure I’m forgetting a few, but these are the apps I use the most, as well as others I’ve heard about. I always love downloading new apps and experimenting, so if I have one to add to the list, I’ll make sure to write an updated post! 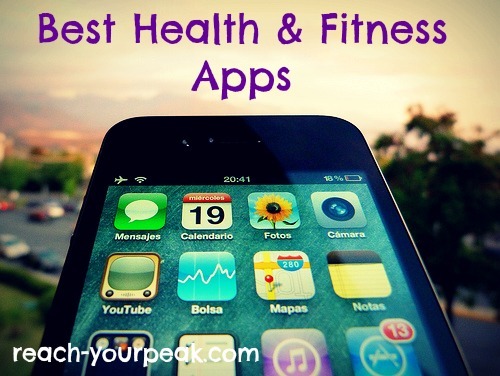 Which health and fitness apps do you use? Do you use something not on this list? I want to know so I can download it! Do you need a week long workout plan? I decided to put together some workouts I have created, and videos into a 7 day workout plan for you, that you can follow this week! There you have it-a week of workouts! Feel free to move around days, or the rest day to whatever works best for you. Also, if you want a second rest day, use the Tuesday cardio day as a rest day. Let me know if you have any questions about any of these workouts! 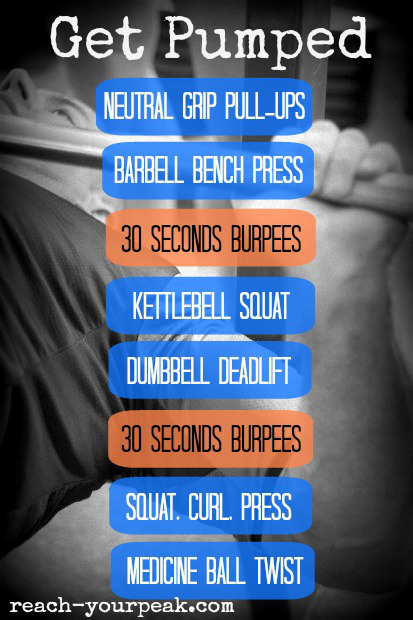 Which of these workouts do you want to try? What types of workouts would you like to see more of? I always love feedback! Earlier this week, my local lululemon store posted that they were having a Blacklight Yoga Party on Thursday, at a studio in my area. I quickly RSVPed for my sister and me because we had never done hot yoga before. I was really nervous…I was afraid of sweating an insane amount and being stinky and having people be disgusted (sometimes I over-think things). My yogi friend assured me that everyone will probably smell and be insanely sweaty. Drink a lot of water in the days leading up. I absolutely loved it. I have had this instructor before at lululemon’s community classes, and usually it’s pretty mellow, but this class was really upbeat and fun. We got light-up bracelets at the door too! The class started with upbeat music, and once Timber by Pitbull & Ke$ha came on, everyone was singing and grooving along to the beat. PS – I’m obsessed with that song, I could listen to it on repeat. This was certainly the most challenging yoga class I’ve taken. Obviously, because it was hot. But also, the sequence of movements and how long certain poses were held made it tough! The good thing was that the room wasn’t TOO hot-about 97-100 degrees. I have read other reviews of hot yoga where people have said it was too hot to even concentrate, and that’s what I was afraid of. When people say the heat helps you get deeper in your poses, they aren’t lying! I got into my deepest downward dog, usually I have to keep my knees bent, but this time they were straight and I almost got my heels to touch the ground. Overall, it was a great class, and I love yoga in general. She ended it on a spiritual note, reading us a quote while we lay in corpse pose. I left feeling refreshed and really wanting to commit to adding more yoga into my life. Have you ever tried hot yoga? Or yoga in general? Is 2014 going to be your year? Have you committed to living a healthier lifestyle? That’s great! You may be excited and ready to tackle everything that comes your way, but while your motivation is awesome, make sure you don’t make these mistakes in your new journey! Trying Too Many Things At Once. You may be excited to start eating healthier and workout out regularly, but don’t be too overzealous! For example, if you want to start eating healthier, try cutting out one “bad” thing for a week, then add another. It’ll be easier to manage cutting out soda the first week, then processed food the second, and excess sugar in the third, than it would be to try to cut every bad habit out at once. Same thing goes with the gym; you may want to hit the gym every day, but start slowly. Your body is just getting used to this. Start with 2-3 days per week, then add on as you get accustomed. Trust me, if this is your first time lifting (or you’re just getting back into it), you will be sore even with only 2-3 days of working out! Not Setting Proper Goals. What exactly are your goals? Do you want to lose weight? Gain muscle? Setting proper goals is key, as well as attainable goals. You can’t expect to lose 50 lbs. in 1 month, or squat 100 lbs in the first few weeks. Set small goals at first, such as, “I want to lose 1 lb. 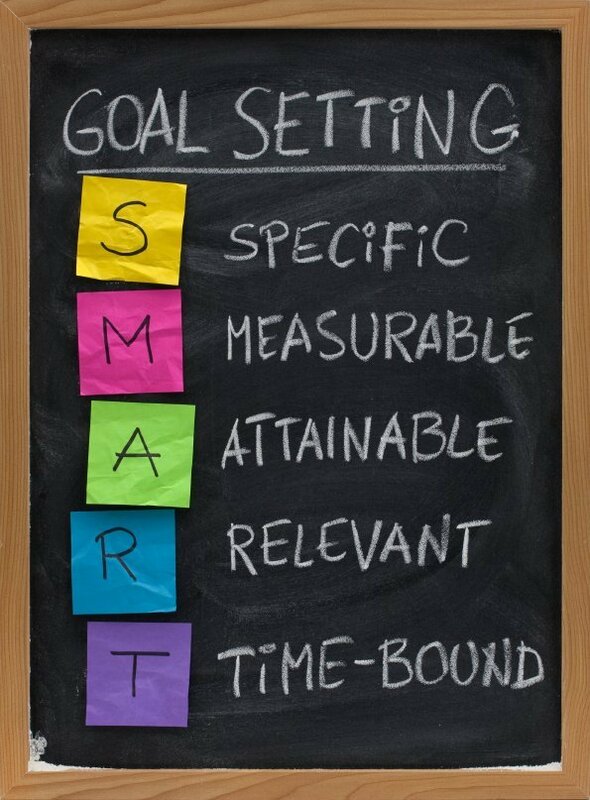 a week,” or “I want to lose 5% bodyfat.” SMART goal setting is a great way to set attainable goals. Not Researching Proper Workouts. Just as you need to set proper goals, you need to assess what it is you want to accomplish. You may try out everything: lifting, running, Zumba, spin, etc. Do you want to run 5K? Or be able to do pull-ups? Because both of those will require totally different training. If you want to run a 5K (or any distance), research different training plans. Before I started marathon training, I read 3 books by 3 different authors on 3 different training approaches. Find the best one that you think will work for you. If you don’t think you will make it to the gym 5 days a week, then don’t choose a plan that has you in the gym 5 days a week! Not Eating Enough. If your goal is to lose weight, you may think the easiest way is the good ol’ “cut 500 calories per day out” and exercise. 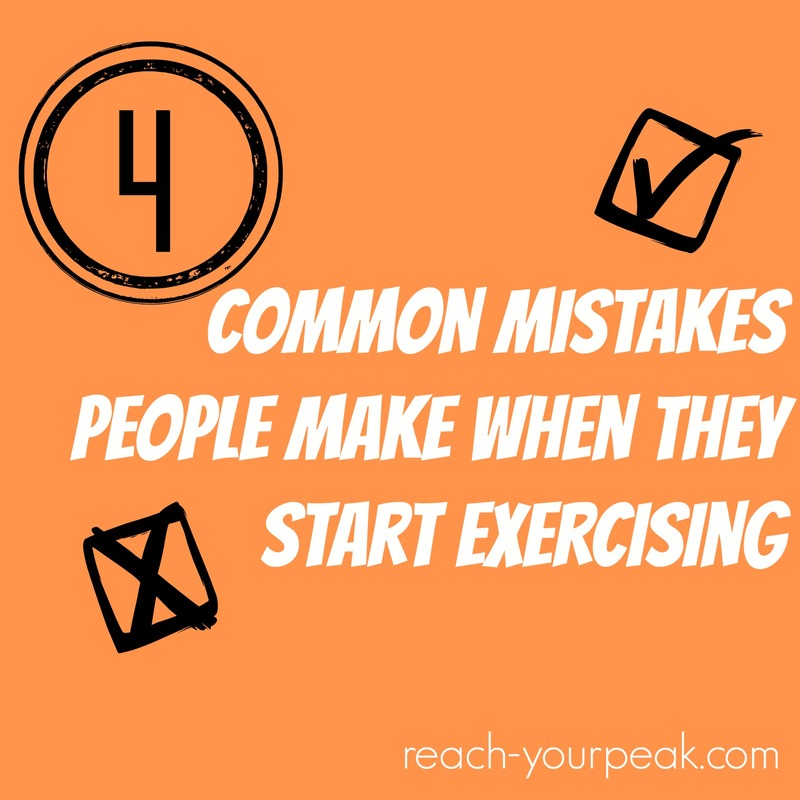 But if you’re exercising on a regular basis, then you need to make sure you are fueling your body correctly. You may be surprised at how many calories you actually need. I thought 1,500 calories would be enough for me, then put my stats in multiple calculators which told me I should be eating anywhere from 1,800-2,000 calories! I don’t have a specific one that comes to mind, but google “calorie calculator” and try out multiple ones. Also track your intake for a few days to make sure you’re eating enough. I like the app Lose It! because you can add or scan in foods, and it gives you a pie chart breakdown of your macronutrients (carbs, protein, fat). I talk about this app more here. Remember, calories are not the enemy! What advice and tips would you give? Have you experienced any of these mistakes?